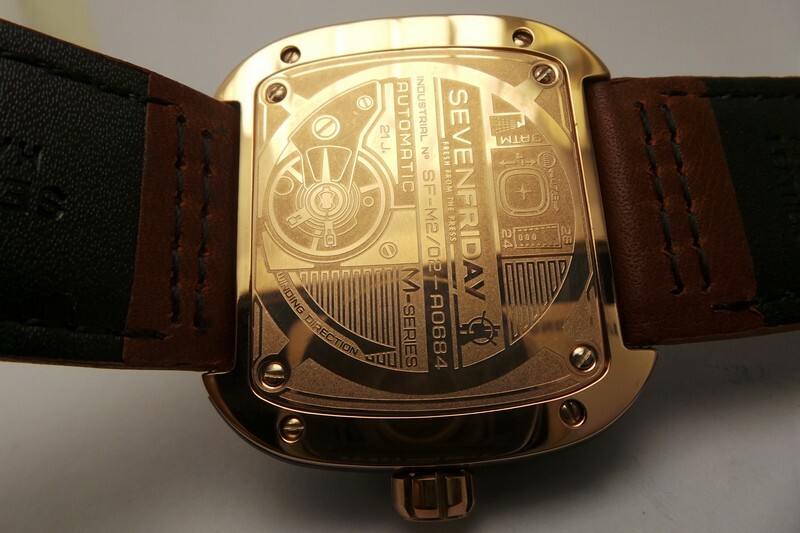 At the first sight with SevenFriday watch, I am kind of surprised to see such a thing is also a watch. First, it has a square case shape not which breaks the watch impression in my mind since I knew watch. Second, looking at its dial, which is looking like an art more than a watch. Breaking the rules and being creative is a core to be competitive in today’s watch. 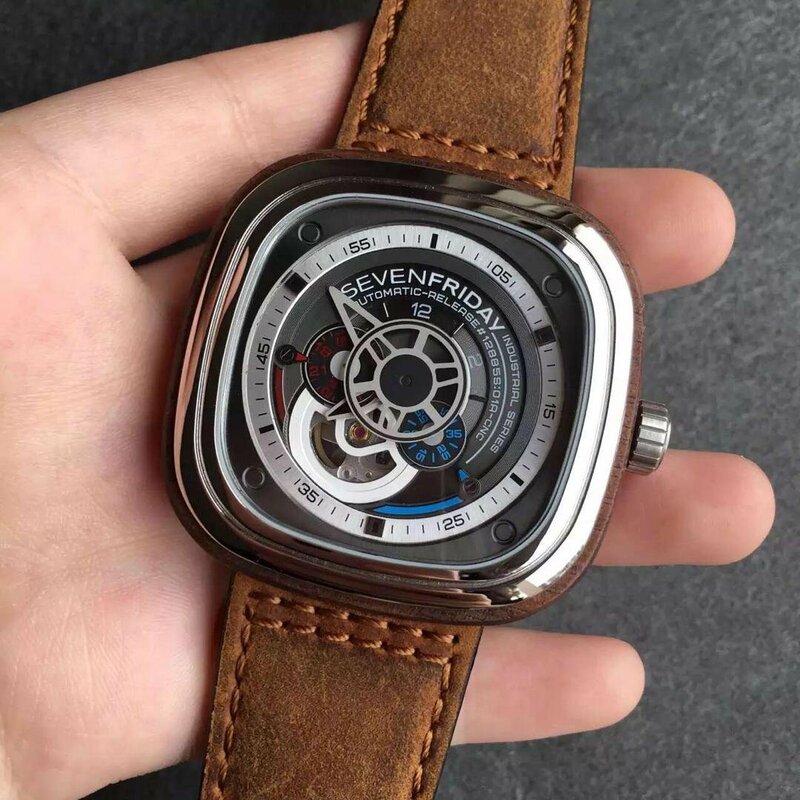 Well, we should know replica watch factories also will follow the market trend, today I will show you a replica SevenFriday P3-2 watch. The factory V6 where it comes from bought an original to research its structure, process, function and material and then made a mould to manufacture this 1:1 replica piece. 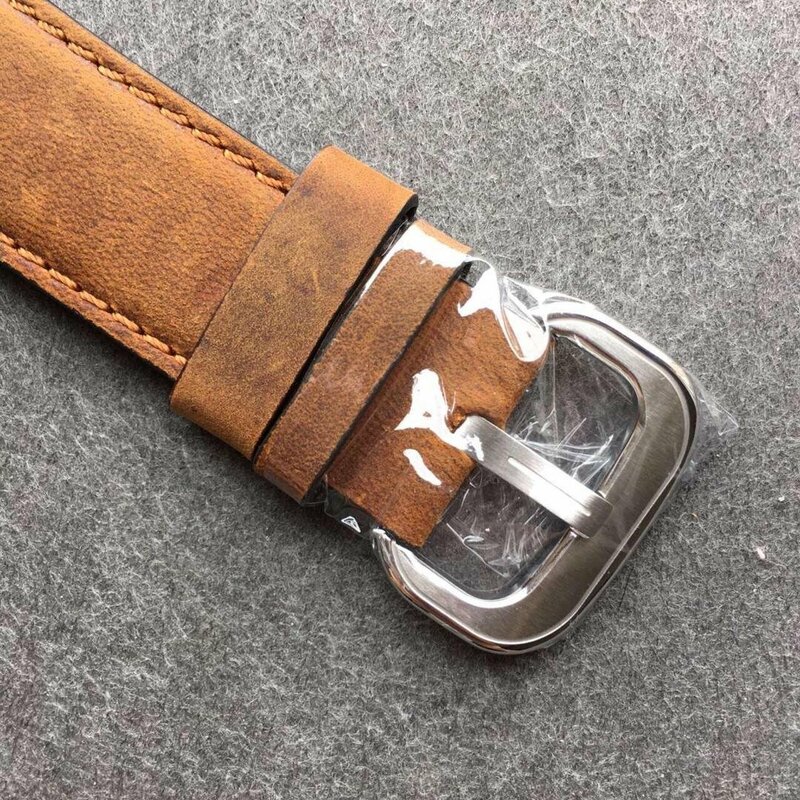 There are more surprises coming, first comes the case size 47.5mm*47mm*14.5mm that designed for both men and women. 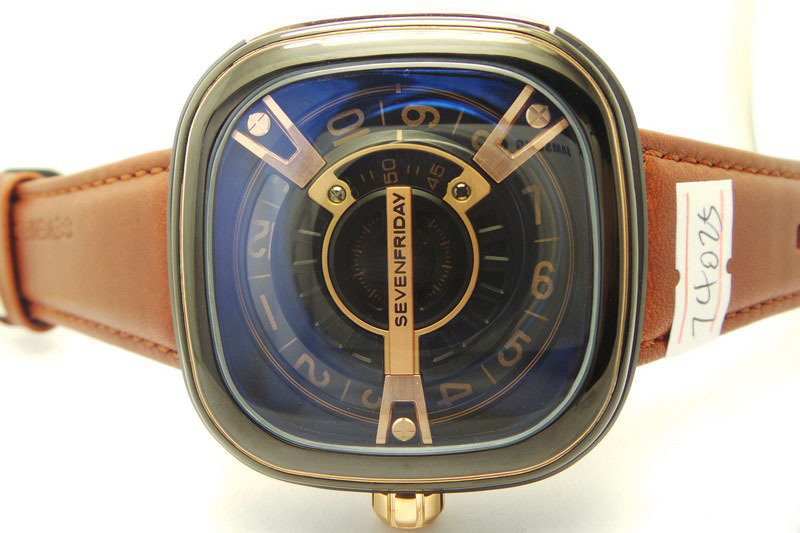 This must be very attractive for the young who want to be different, surely a watch like this will let them be. 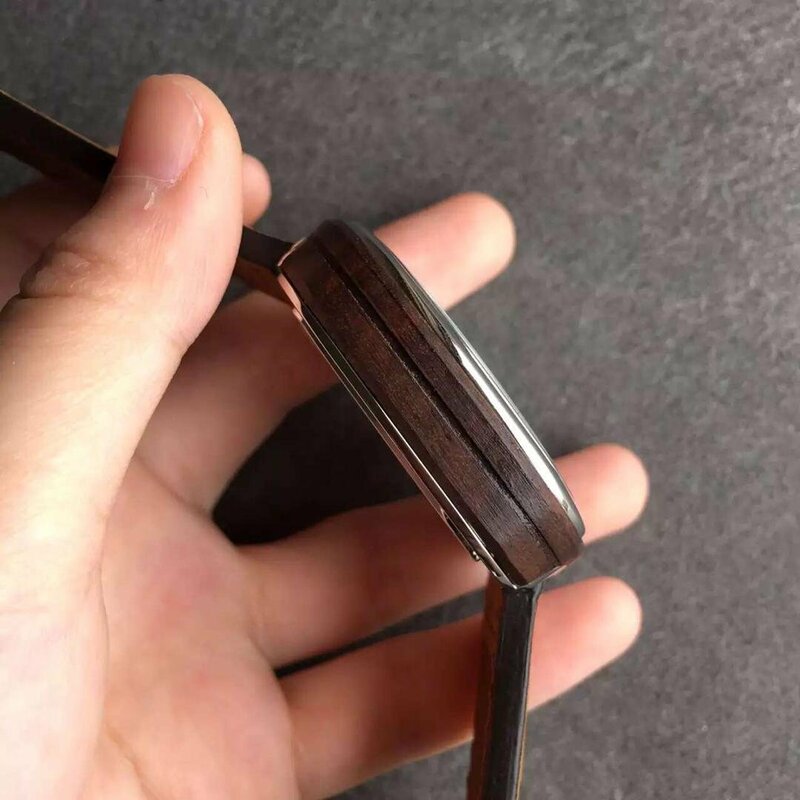 Second comes the case is made of solid wood, I have been seen cases made of stainless steel, ceramic and rubber, but wood is the first time. From the side, we can see the wood pattern is elegant and special. Next comes for the multiple-layers dial, showing its complicated structure but is full of artistic sense at the same time. The triangle hour and minute hands connecting to the wheel in the center, under the wheel, there are two small dials, one is for second, another one is for 24hours in original but only for decoration in replica edition. The bezel is polished, bright and the color looks good on it. The crown has the same design logo as the wheel on the dial, matching perfectly. The brown genuine leather strap matches the wooden case well, love the color a lot. Inside the square case , there is a Miyota 82S7 21J automatic movement to keep it running well as per genuine. 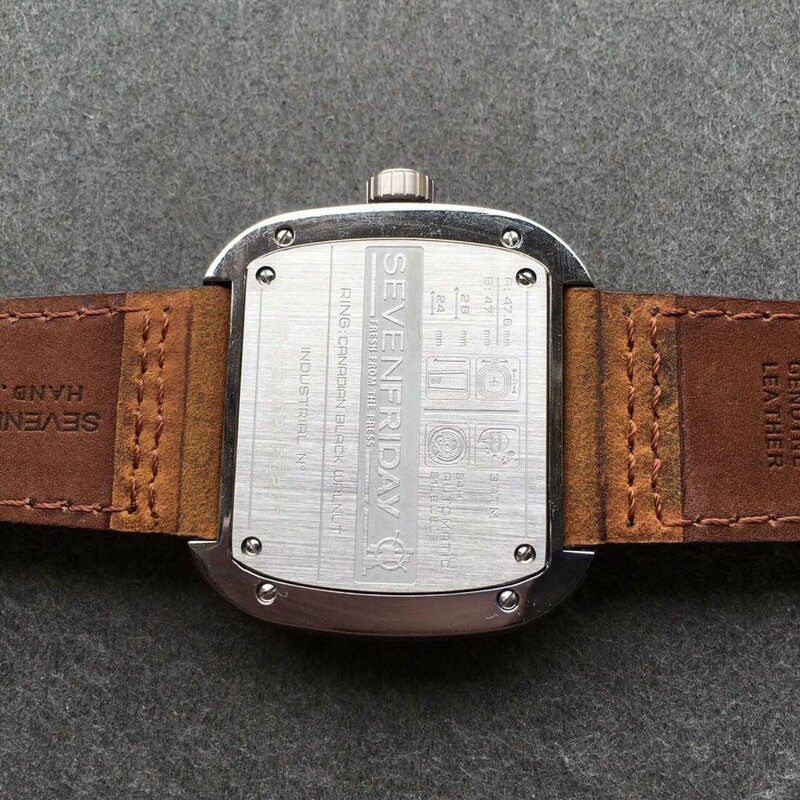 On the back case, we can see all the engraving information of this watch on it. This is a high quality replica, looking as the same as original one. 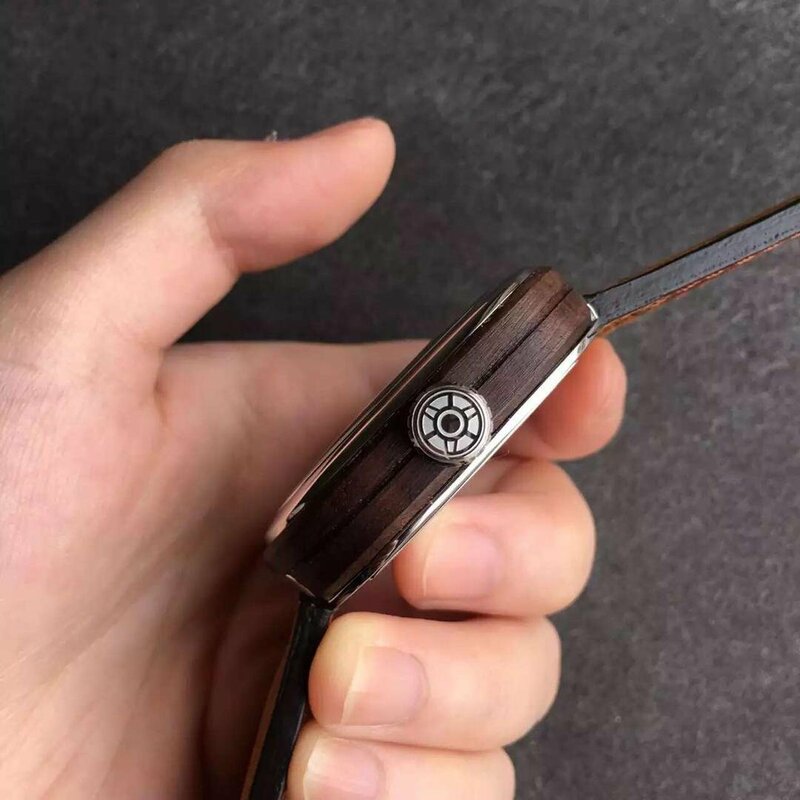 SevenFriday is a new rising star in watch field, the replica version has gotten many attention after being released in the market, actually becomes one of the best-selling replica watches in this year. 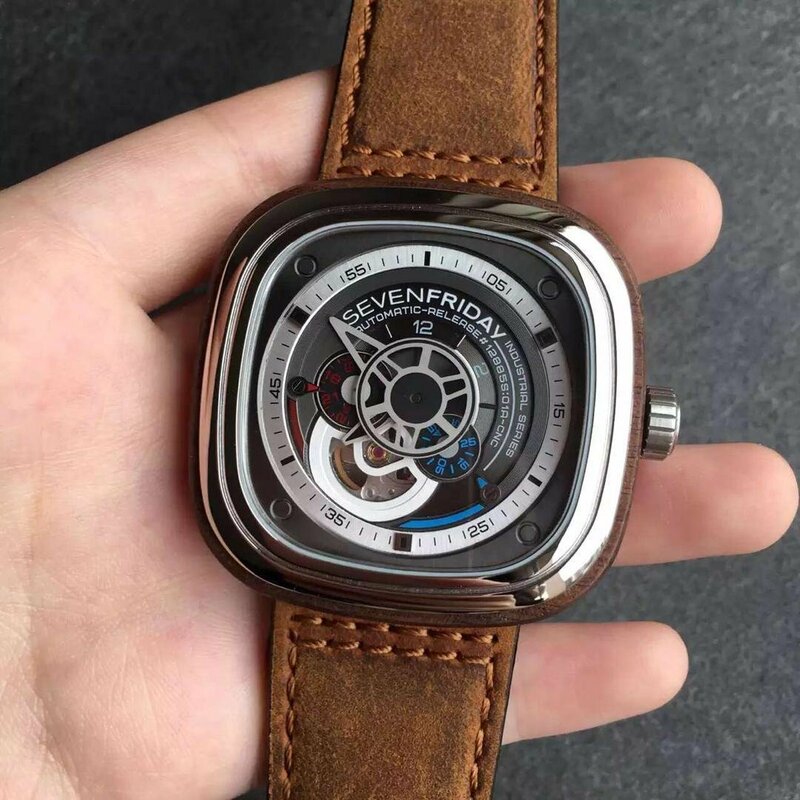 People who buy replica SevenFriday watches are mainly because of their unique dial design and timing style. 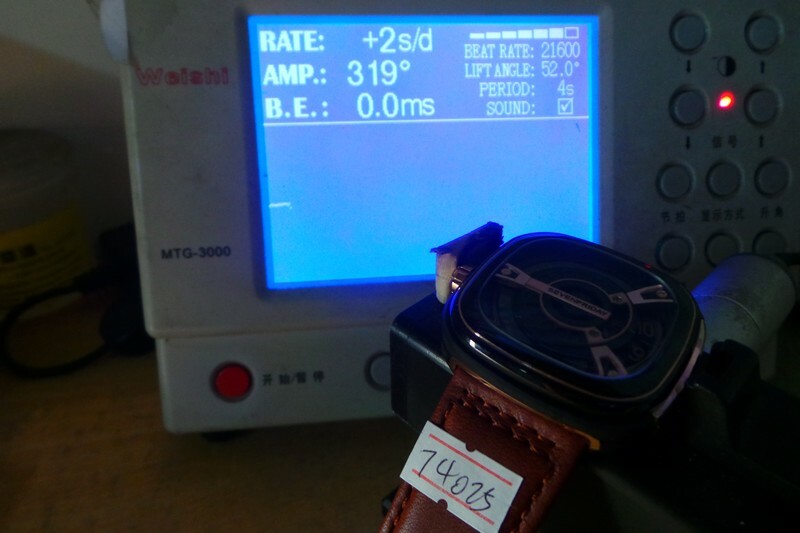 Like this one, square case is polished rounded and smooth, the stainless steel case is plated with black pvd. 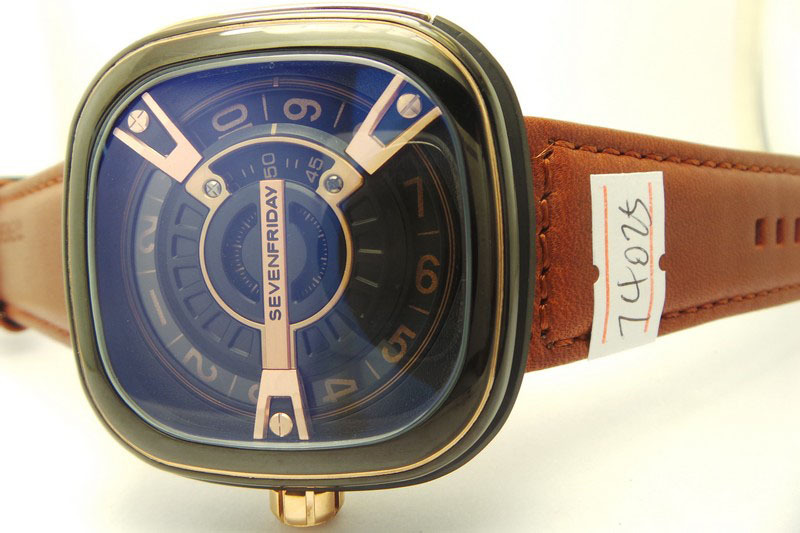 The replica SevenFriday M1-1 watch is a left-handed timepiece, you must observe carefully to read the time clearly. The dial gives you a layered feeling, rose gold disc. The watch is 47mm in case diameter, which is an appropriate size for mens wrist and completely meets the big-size watch fashion trend. 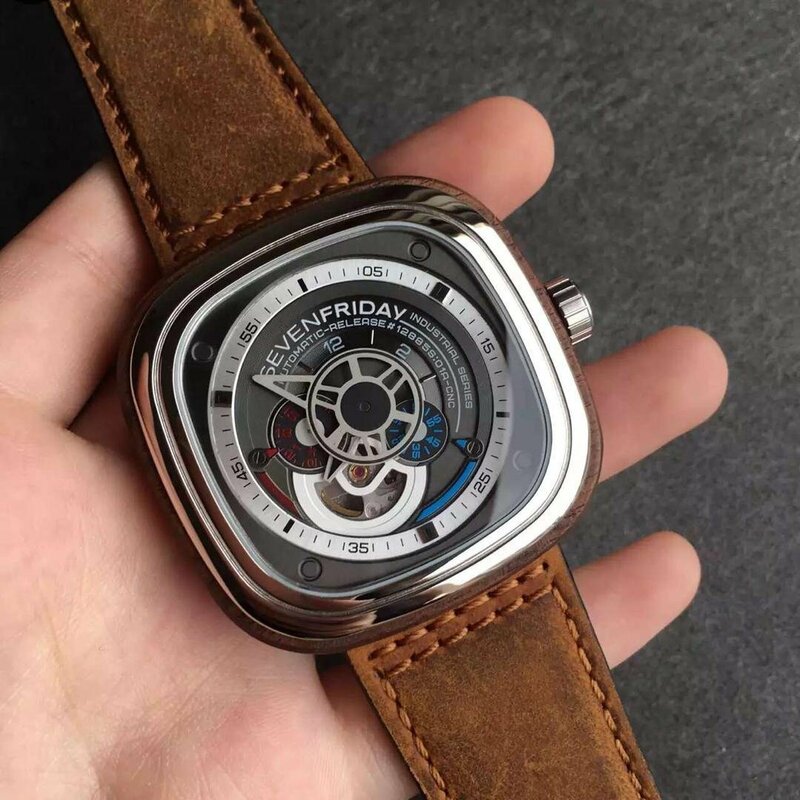 Actually the replica watch is made by a big factory in China, it is the best version among all SevenFriday replica watches made in the market. The watch is equipped with Japanese Miyota 8210, which is an automatic movement, 21 jeweled and beats at 28800 times per hour. The front crystal is thick and features AR coating like the genuine. Maybe some people do not know how to read the time from its dial, the outtermost disc is indicating hours, central disc displays minutes and the smallest disc is for seconds. Now let us comes back to the movement again, it is tested to be 2 seconds faster each day. 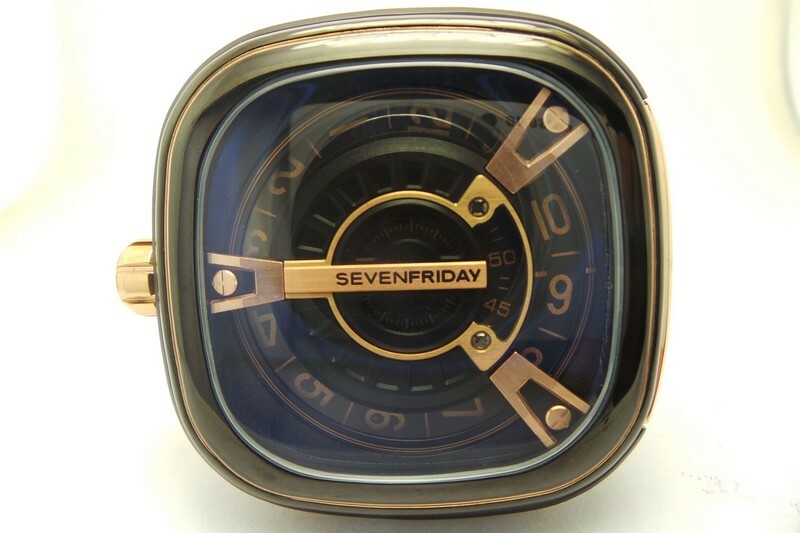 Every spec of the movement indicates that the replica SevenFriday watch is high quality. The case back is fixed by four screws and engraved with some interesting things, you can read more about the watch than the caseback on other brand watches. 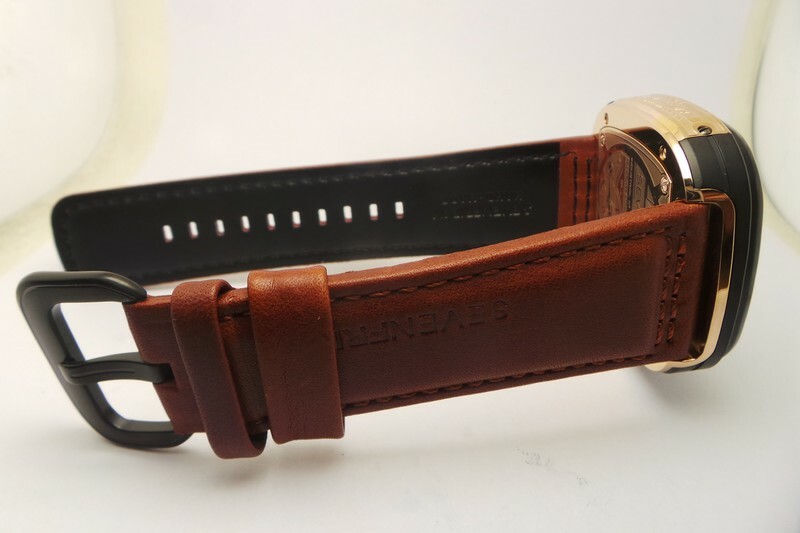 Finally, the brown leather strap looks perfectly fit the whole tone of the watch.